What a huge shock it was to the system arriving in Sydney after spending seven amazing days in the remote areas of Tasmania. I wanted to get some photos of some of Sydney’s seaside swimming pools but unfortunately, after being in Tasmania for seven days I could only spend two days in Sydney. This was taken on my first morning, there was a massive fog surrounding the Eastern suburbs that didn’t burn off for hours, which was pretty cool. The next morning was actually an amazing sunrise but unfortunately after Mr F Stop (aka Rod Thomas) and I stayed up all night discussing the virtues of landscape photography in some amazingly classy pubs (at least I think they were classy) we really weren’t in a fit state to head out and grab the sunrise. We slept in by accident looked out the hotel window and saw the amazing sunrise, kicked ourselves and went back to sleep to try and recover from the big night. Thanks very much mate. A huge compliment coming from an esteemed photographer such as yourself. I love the slow mo of the dude swimming and how well you captured the highlights at the corner of the image! Thanks very much mate. It was a really hard image to capture and work on. In fact I’ve been staring at it since September last year. I’m glad that with the help of people like yourself and of course CF I can start bringing these images to life. Oh poor Jamie, no one commented for you didn’t they? Well I do like your short and it’s nice to see this place taken from a different angle to what you usually see. I don’t know what my computers problem is, or it must be me. I have subscribed to blogs but I don’t get the emails telling me that something has been posted. Am I doing something wrong? I get Marks and Flemming’s, I don’t get yours Jamie or Merv’s but it says I’m subscribed. Any ideas? Thanks for that comment. I definitely want to get back to Bronte again to get some more angles of it. I’m not sure what is going on with the blog subscription. Perhaps try unsubscribing and then resubscribing? Or you can do what I do to keep up with what everyone is doing. I use Google Reader, the downside is that I have to log into it each day to see what is going on rather than getting an email notification but it is bulletproof. Hopefully I have the problem sorted with the subscription, I subscribed again and made sure the send me email box was ticked so hopefully it’ll work now. You’ll have to post again just so I can check HA HA. Well speaking of Merv and new posts. I carried a covert operation into his turf on Tuesday / Wednesday and got a cracker of a shot. I’ll put it up either tomorrow or Sunday. Awesome can’t wait to see it Jamie, I’ll give google reader a try because I do miss alot of posts. Thanks for that. 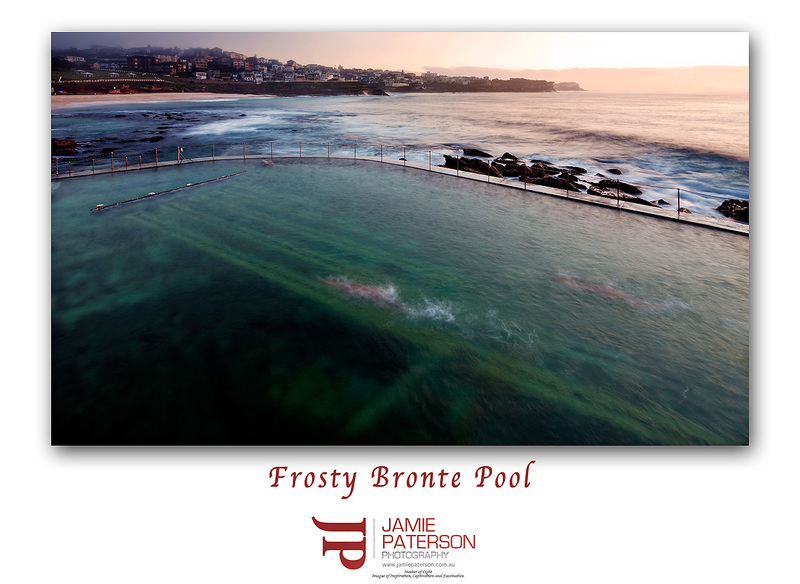 Sweet image Jamie – I love the pool water and guy swimming (as Mark noted too) but also the hint of fog in the residential area in the top left. Thanks Tony, much appreciated mate. I like the hint of fog rolling over the houses as well. It was one of those mornings where you think nothing is going right and I should just go back to bed, but I’ll have a crack at it anyway. Just goes to show you need to always give 100% as you just don’t know what gold you’ll come up with! Another great image mate, I love shot’s of these pool’s. Nice work! Hi Ben. Thanks for that mate. I’m definitely going to have to set aside some time this year to capture this pools. 2.5yrs in Sydney just wasn’t enough time. Hi Stephen. Great to hear from you mate. I hope all is well with you. Thanks mate, as I mentioned it was actually a tough shot to process and I’m glad I did now because of you guys. Well all that effort put into processing it was worth it hey! A great image here mate…. The swimmers really top it off, and those sea fog days are pretty rare… so you were lucky in a way! Dam I wish I could tag Rod in this somehow. hehe. Thanks mate. I knew he was up to something by keeping me up all night. Thanks for the comment as well. Nice work on the image processing. I love the images taken of the pools in Sydney.